Sorghum-sudangrass grows 5 to 12 feet tall with long, slender leaves, stalks up to one-half inch in diameter and aggressive root systems. 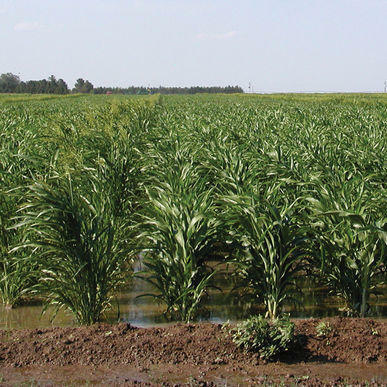 Sorghum-sudangrass hybrids can be grown throughout the year. wherever rainfall is adequate and soil temperature reaches 65° F to 70° F at least two months before frost. Once established, they can withstand drought by going nearly dormant. Sorghum-sudangrass hybrids tolerate pH as high as 9.0, and are often used in rotation with barley to reclaim alkaline soil. They tolerate pH as low as 5.0. It will produce large amounts of organic matter, cycle nutrients, suppress weeds and loosen soil with its deeply penetrating roots. An excellent catch crop for excess nitrogen. It grows quickly and needs to be mowed regularly to control height (up to 7 ft.).